If some of your workforce have allergies to latex, it's important that you find a reliable alternative for them. 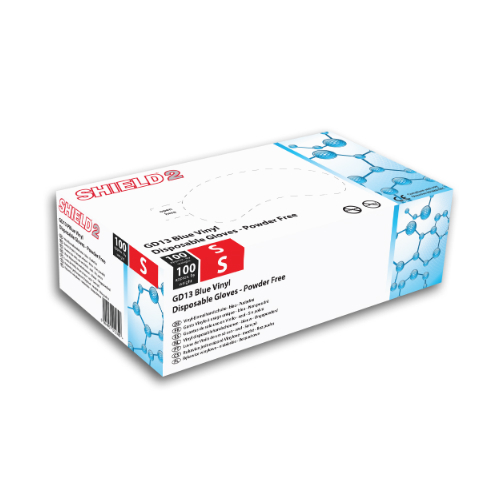 The Shield2 GD13 Blue Powder-Free Vinyl Disposable Gloves (Pack of 100) are economical but durable and are made from vinyl. These gloves ensure your workers are able to get the protection they need without suffering from any unfortunate reactions. Tested in accordance with EU standards, the Shield2 Blue Powder-Free Gloves perform at a high level. The results for these tests are below. The Vinyl Disposable Gloves have been evaluated to see the extent to which they're suitable for coming into contact with food. These gloves can be used with all foods except fatty foods. The Disposable Vinyl Gloves are available in four different sizes and are ambidextrous in design so you don't have to worry about reading the glove's label. To find out which size you require, please measure your hand across the widest part of your palm and refer to the sizing table below. Please note that all sizes of this glove have a minimum length of 240mm.